Try this oatmeal-based snack for a granola bar substitute. Lots of protein in the peanut butter with fiber in the oats and flaxseed. Plus you get the sweetness of honey and dark chocolate. Almost like a cookie, but in a ball for fun! Mix all the ingredients together in a bowl, roll into balls and enjoy. Can be stored in airtight container in the refrigerator for a ready to go snack. As I shared with Tammy on a prior comment, I don’t provide nutrient breakdowns for my recipes, but focus on cooking healthy and eating healthy. There are some great free online nutrient/ingredient breakdown calculators that can provide you with this info in seconds. I really enjoy these as a healthy snack. I love, Love, LOVE these! I make them all time! I just made these, they disappeared so fast, I had to make another batch, the whole family loved them! Thanks for your feedback Sheri! They are easy to make and do disappear fast 😉 Stay Healthy! Hi Patty. 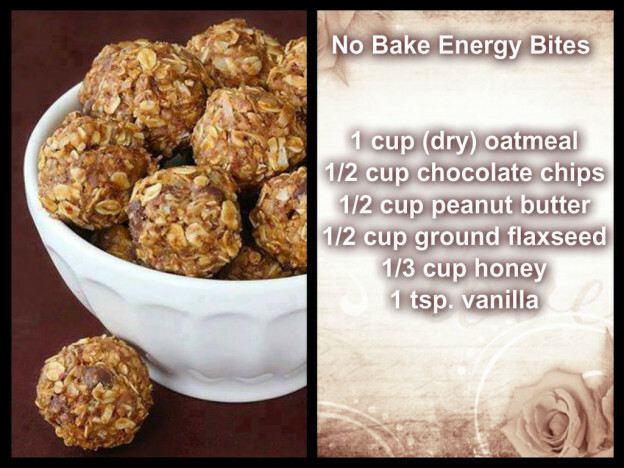 Feel free to omit and add extra oats instead. If you bake with protein powder, adding a scoop of a vanilla protein blend would be an option as well. Take into consideration that anything with a drier consistency that is added, adjusting the liquids will also be necessary. Stay Healthy!